Kathie said that this month’s block reminded her of a piano recital dress from days past, so I may as well confess that after I decided on the white-pink-black colorway for this block, I was reminded of the Good and Plenty candy I remembered loving as a kid. When I went looking for a photo of the packaging, of course, now it looks completely different (with a purple background!) Last week, I found this photo of the old Good and Plenty packaging from my youth. Ps. 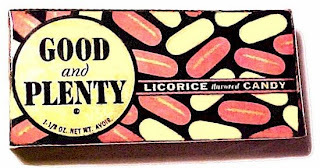 I also learned that Good and Plenty is the OLDEST branded candy in America. Who knew? If any of this is familiar to you, or you’re curious, you can read more about the history of Good and Plenty candy on the Hershey site, here . . . and sing the famous theme song (which I confess, I DO remember).